Yesterday I looked around the kitchen and saw some food items that needed to be put to use. There was a tomato, a pomegranate, a half-package of goat cheese, an asian pear, a good-sized end of some home made white bread, and a quarter jar of marinara sauce. I could have reduced the marinara to tomato paste and frozen it for later use, and the other items weren't THAT close, except the tomato, which was on the verge of squishy, but holiday leftovers are around the bend and I'm trying to clear out some kitchen space. I'd been meaning to take the Zojirushi Home Bakery Supreme Bread Maker for a pizza dough spin. Eventually I'd like to run through all of its wonders, but with the items on hand pizza was calling. 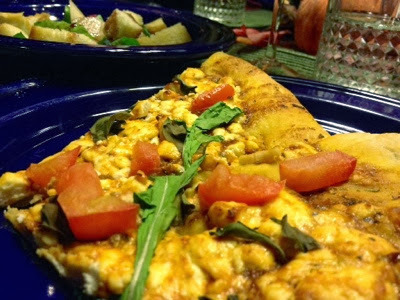 With the dough kneading and baking I was free to focus on putting the rest of the meal together in my head. The marinara wasn't going to cover a whole pie. I remembered my roasted banana ketchup and tried a little with a bit of the marinara on a spoon. It was a zesty sauce. I was on my way. I added three tablespoons of the ketchup to the marinara. Clipping some rosemary and basil from the garden, I blended them, finely chopped, into the sauce and let it all marry while I plotted. I had sauce, I had goat cheese. 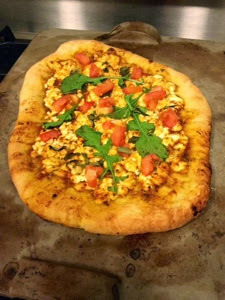 I had also clipped some arugula among other salad greens and put some aside for the pizza. Next was the bread. It was time to make some croutons. Melting a tablespoon of butter in a ten-inch skillet I added a two tablespoons of olive oil and a bit of garlic powder. After giving it a swirl to mix the ingredients I dropped in the now crouton-sized bread and stirred them around until they were covered. Then I popped them into a 250 degree oven until they were crispy and then into the warmer until the salad was ready. When the dough was done I quartered it and rolled it out into a thin crust onto which I brushed a mixture of butter and olive oil. Next, I ladled on a thin layer of sauce, crumbled on a layer of goat cheese, hit it with some fresh-ground white pepper, and put it all onto a pizza stone and into a 400 degree oven for 15 minutes. 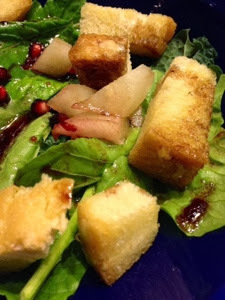 While the pizza baked I opened the pomegranate and washed the greens for the salad. Putting the greens onto salad plates I scooped pomegranate seeds on top and sliced Asian pear for the middle of the salad. I also mixed up a dressing of equal parts extra virgin olive oil, balsamic vinegar, and grenadine. The timer shouted that my fifteen minutes were up and I put on my trusty Ove Gloves to pull out the pie for more toppings. While I had been making the salad I also sliced up the tomato into medium-sized chunks and at this point added them to the top of the pizza along with some fresh basil leaves and arugula. I put the pizza back into the oven for another five or so minutes until the crust was browned and the cheese melted. When the pie came out of the oven I put the croutons on the salad and dressed it. Hello, dinner. Hello, room for leftovers. Goodbye waste. How was the machine-made pizza dough? Really tasty! I may try tweaking their recipe some time, but for now I really like their basic dough and will make it again. The time saved was also welcome. Hurray, technology.